We look forward to meeting you again at one of the forthcoming events of our Association ! We are really pleased to announce our Regulatory Debate. 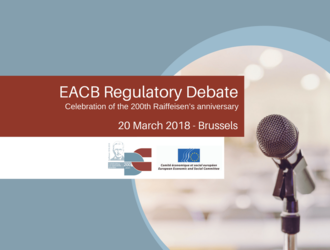 The regulatory debate 2018, organised in collaboration with the EESC, aims at continuing the dialogue between high-level co-operative banks representatives, EU policy makers, authorities and stakeholders at a crucial period of the EU legislative process. Indeed, the EU Institutions’ mandate will end in 2019. Mid 2018 coincides with the time limit to table new initiatives and finalise the outstanding ones, including key milestones such as the completion of the banking union, of the capital market union, the banking package and prudential regulation review, the implementation of IFRS 9 and so on, according to the ambitious EU Commission’s work plan 2018. Those initiatives are likely to reshape the core features of co-operative banks and affect their ability to continue financing local growth. This is why the regulatory debate aims at ensuring that co-operative banks specificities are understood and taken into account by policy makers and regulators so that the co-operative banks difference in terms of ownership structure, organisational settings, risk profiles and economic and social role are not undermined. - The overall regulatory framework produced over the last years both on the prudential side (CRR/CRD4 ) and on the product side (MIFID2, PRIIPs, EMIR, PSD2, GDPR): impact on co-operative banks. - What views and recommendations in the context of the completion of the banking union (ESAS review, EDIS)? - Developments in EU banking supervision: how is proportionality taken into account? - How to adapt the resolution framework to co-operative banks? - New governance requirements and co-operative banks specificities.